When you pick up your bike at the bike shop in Old Town Alexandria between 10:30am and 11am, you'll be provided with a map and easy directions on how to get to Mount Vernon. Bikes come in all sizes so you can find the right fit for the tour, once you've chosen, you're ready to ride! Take in views of the Potomac River on your easy 9-mile (14.5-km) ride along the historic Mount Vernon Trail.When you arrive at beautiful Mount Vernon Estate, George Washington’s famous home, lock up your bike outside the grounds and spend time at your leisure exploring this 18th-century National Historic Landmark, which once spanned 8,000 acres (3,237 hectares) and now features 500 preserved acres (202 hectares). Walk through the restored mansion and admire the stately architecture and lavish décor, and spend time wandering through the lovely gardens. Visit the farm, browse fascinating historical exhibits at the Donald W Reynolds Museum and Education Center, and stop by Washington’s tomb, a memorial dedicated to the slaves who lived and worked on the estate. 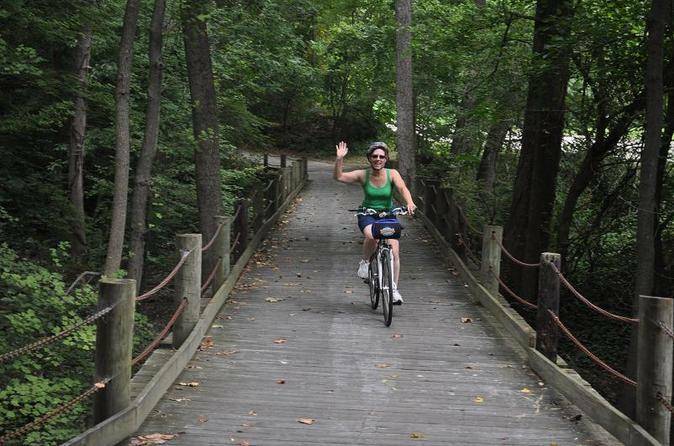 Have lunch at the food court (own expense) before hopping on your bike and returning 9 miles (14.5 km) along the scenic Mt Vernon Trail, arriving at the bike shop in Old Town Alexandria by 5:45pm. Upgrade: Potomac River Cruise After exploring Mount Vernon Estate, head to the Mt Vernon dock at 4pm to board Miss Christin. Sit back and relax as you take a narrated boat cruise along the Potomac River back to Old Town Alexandria. You’ll arrive around 5:30pm. This option is ideal for those who'd prefer an easy 9-mile (14.5-km) one-way bike ride instead of the moderate 18-mile (29-km) round-trip ride.